ORONO — Even the football players at the University of Maine admit that the school is better known for hockey. But the Black Bears football team, which is eying the playoffs after improving to 10-1 for the first time in the program’s 121-year history, hopes that could soon change. “Everybody loves a winning program and we’re hoping this starts a different type of atmosphere around here,” senior quarterback Marcus Wasilewski said. For UMaine, ranked No. 4 in the FCS, college football’s second level, a lot of “firsts” hang in balance. The Black Bears are trying to win their 11th regular-season game and become the first Black Bears team to go undefeated in the Colonial Athletic Association, as well as the first to host a playoff game. “This is an opportunity to go down a street we haven’t been through before,” said coach Jack Cosgrove, in his 21st season. But the Black Bears (10-1, 7-0 CAA) first have to face their biggest rival, No. 21 New Hampshire (6-4, 5-2), on Saturday. The competition for the Brice-Cowell Musket trophy is just as big as any playoff game, players said. Expected to finish near the bottom of the CAA, the Black Bears have clawed their way to the top and now have the chance to win it all. And the fact that UMaine football is overshadowed by success on the ice — where the school won national championships in 1993 and 1999, and has produced NHL players aplenty — serves as a motivator, Cosgrove said. The success could be a big boost to recruiting, said Matthew Mulligan, a tight end for the New England Patriots, who played two seasons with the Black Bears. “To guys who are serious about playing in college at a Division I level, it really would say something to be able to say âLook these guys are good,”‘ he said. 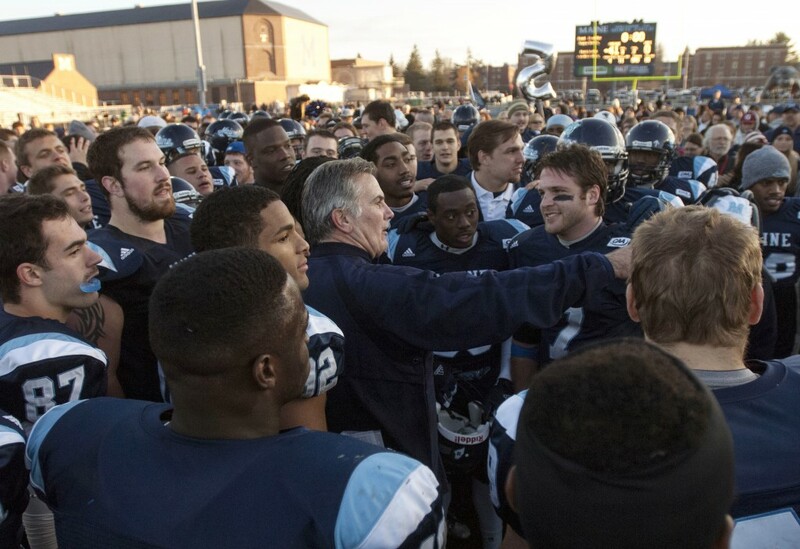 UMaine has a chance to secure a bye in the first round of the playoffs. And if so, it would host a second-round game in Orono for the first time in school history. Not only would the Black Bears be able to take advantage of their experience with Maine’s bitter-cold weather, but a home postseason game would also be a perfect way to end their time on campus, seniors said. Amid all the excitement, Cosgrove said the team must remain focused and disciplined.